Jay Ajayi runs into the endzone for a fourth-quarter touchdown in front of Atlanta's De'Vondre Campbell (right) and Damontae Kazee. The Eagles beat the Falcons 18-12 to open their season 1-0. Read all about the game here. How do you think the Eagles performed? Grade the team below. The Eagles struggled to move the ball on the ground most of the night. Through three quarters, they were averaging just 2.5 yards per carry. But they had two big runs on their game-winning touchdown drive late in the fourth quarter. Corey Clement had a big 21-yard run through a huge hole up the middle on a third-and-two play at the Atlanta 35. Then two plays later, Jay Ajayi scored from 11 yards out to put the Eagles ahead. Nick Foles didn't play as poorly as he did in the preseason, but this isn't one he'll be putting in his scrapbook. He averaged just 3.4 yards per attempt and didn't have a touchdown pass. Alshon Jeffery was missed. Nelson Agholor and Zach Ertz had a collective 13 catches, but averaged only 6.2 yards per catch. 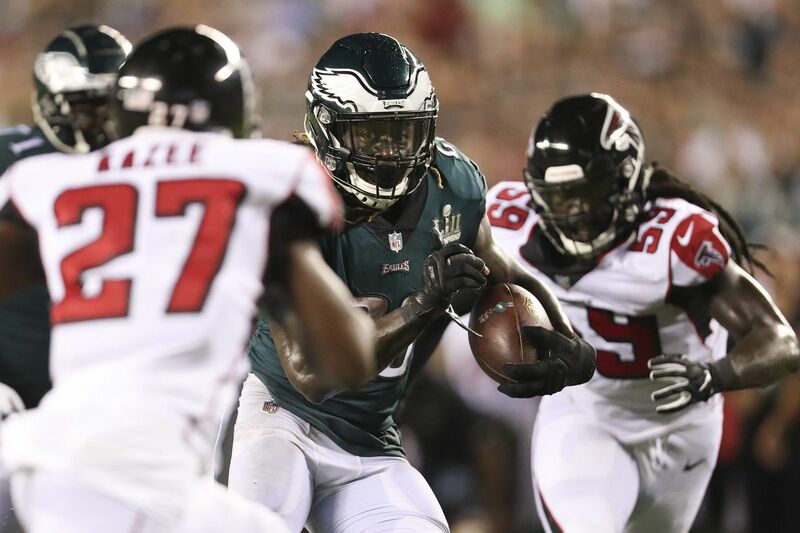 Playing without valuable linebacker Nigel Bradham, the Eagles did a good job of keeping the Falcons' rushing tandem of Devonta Freeman and Tevin Coleman under control. Freeman and Coleman averaged 3.7 yards per carry. Freeman had a 20-yard run on the Falcons' first possession, but was held to 16 yards on his other five carries. The Falcons had just four rushing first downs. The Eagles' front four was relentless in their pursuit of Matt Ryan, sacking the Falcons QB four times and having two others negated by offsides penalties. Ryan was held to a sub-50.0 completion percentage for the first time since 2011 and completed just 6 of 13 third-down pass attempts. Cornerback Rasul Douglas had a fourth-quarter interception in the red-zone that foiled one potential scoring threat, and Ronald Darby forced an incompletion on Ryan's pass to Julio Jones in the end zone on the final play of the game. Punter Cameron Johnston had an impressive NFL debut. He had a 52.2-yard gross average and 47.0 net. Darren Sproles averaged 9.7 yards per punt return. Dave Fipp's units committed way too many penalties. Falcons PR Justin Hardy was held to 5.5 yards per return. All four of Jake Elliott's kickoffs were touchbacks. No Alshon Jeffery. No Nigel Bradham. No Carson Wentz. And yet they still managed to beat a very good Falcons team. They didn't run the ball particularly well. They didn't throw it particularly well. But their defense came up big. The Falcons converted just four of 15 third-down opportunities.